Busy Day for West Grove EMS - 12 Calls! Thursday, September 6, 2018 turned out to be one of the busiest days yet for the ambulance crews at the West Grove Fire Company. On that day, the ambulance was dispatched 12 calls in a flurry of activity that can only be described as far from a "normal" day -- as if any day on a 911-ambulance service is normal. To provide some perspective: in 2017 the West Grove Fire Company ambulances were dispatched 2,394 times -- that's an average of about 6 calls per day, and about 46 calls per week. On Thursday, West Grove EMS had 12 calls -- five of those were "first" calls (meaning that the ambulances were in quarters for the first call), four "second" calls (meaning that these were calls when the ambulance was already on a first call, when the second call came in), two "third" calls (meaning two other calls were already underway), and a rare "fourth" call (meaning the fourth emergency at the same time three calls were underway). These calls came from seven medical emergencies, one trauma, one service call (help a patient up), one fire standby, and one request to assist a neighboring EMS company for mutual aid. 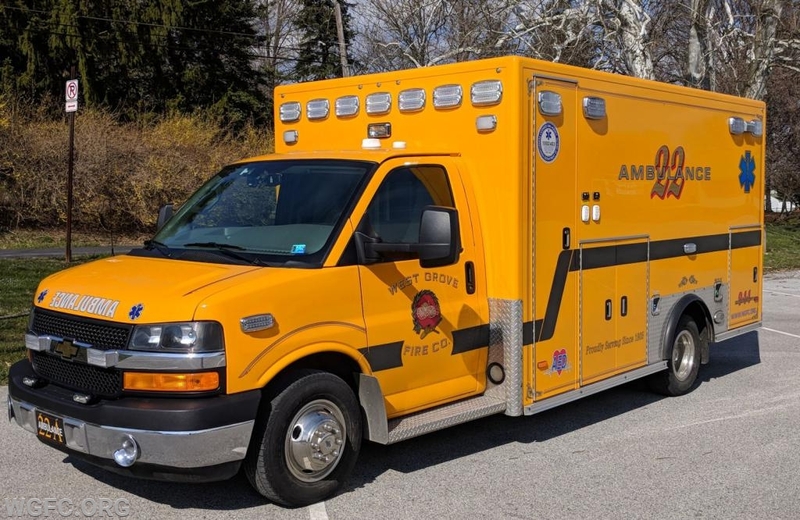 West Grove EMS covers a territory of 88 square miles, stretching across portions of Londonderry, London Grove, Franklin, and London Britain townships, and all of Penn and New London Townships, and all of West Grove Borough. The fourth call in the district was not possible to respond to -- as West Grove has just three ambulances. WGFC members did respond in Squad 22 to assist a crew from Avondale who handled the call as a mutual aid response. Not every day is as busy as this one. However, the WGFC has worked hard to staff an organization that can scale quickly to meet the emergency needs of residents, businesses, and visitors to our community. Close working relationships with neighboring organizations also make this possible. Our staff of trained firefighters and EMTs, including a mix of volunteers and career staff, make this all possible. We are proud to operate one of the very best combination departments anywhere, and stand ready to respond in case of emergency. As of the end of July, West Grove EMS has responded to 1,505 calls for assistance. It's shaping up to be a very busy year. WGFC EMS was dispatched to 12 calls on Thursday -- a busy day by any measure.